Hi Funky Polkadot Giraffe readers! My name is Kimmie and I am in the middle of transforming my current blog Live Fancy to my new blog Sugar and Dots. To help kick off the first day of my new site, and to join in on the super fun party over here, I would love to offer you a Family Tree Print from my shop. I can either send it to you in PDF format so that you can print several copies on your own, or I can send you an 8x10 on glossy photo paper. This tree can hold up to 26 names or dates, and makes the perfect gift. and leave a comment telling me what your TWO favorite items are. I love the family tree best, but I have to say that the sperm confetti comes in at a close second!!! 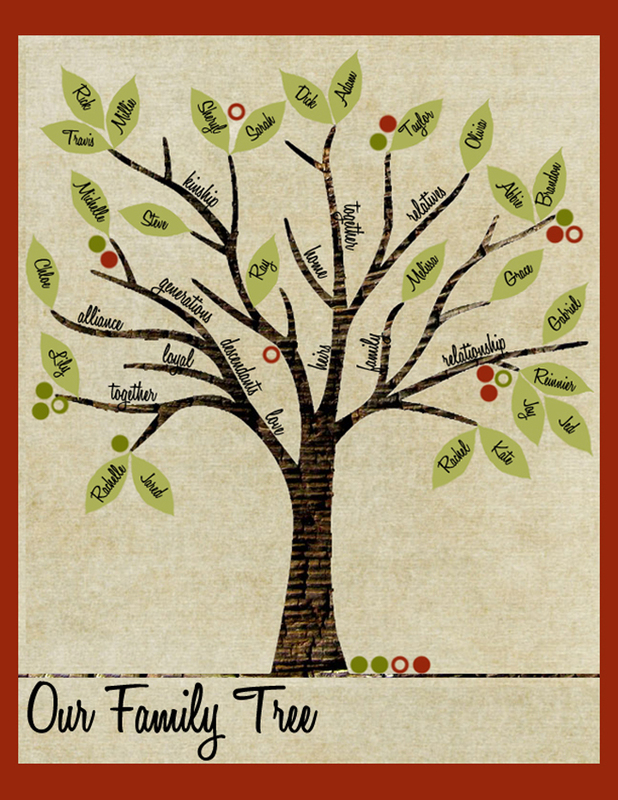 Love the family tree PDF, but I am a big genealogy lover. The fall subway art PDF is super to for this time of the year. Oh, by the way I found you from tatertots & jello. I love the Family Tree and the Fall Subway art. I love this family tree!!! and i love the fancy pants. Love the Bloom Necklace and the custom blog button! I need one of those. I love the Family Tree and the Simple Flower Hair Clip. love the bloom necklace 3 and family tree! Love the Fall Subway Art and Fancy Pants!!! I love the fancy pants and the tissue cases, too cute! Such cute stuff! I love the family tree print and the flower headband! I love the princess hair clips and the family rules print. I love everythingggggg in kimmies shop! I love the skinny flower headband! Love the Bloom Necklace. and the Fall Subway Art Print! so cute! Ok, the sperm confetti is too funny. I don't know what I would ever do with it, but it would make me laugh. I also like Fancy Pants 3. Very unique stuff! I love the Family Rules Print and the Skinny Flower Headband. All her products are soo cute! I like the bloom necklace 3 and the headband. I love the princess hair clips & the family tree print. I like the Fall SubwayArt Print and the Fancy Pants w/ the cupcake. My favorite things are the family tree and the bloom necklace!! It's hard to pick a favorite! I love the family tree and the skinny flower headband! I love the chenille rosette rings and the fall subway art. Such a cute store. i love love love the family tree and the fancy pants! I love the skinny flower headband! I really do love the family tree, but I also love the rosette ring!! I love the skinny flower headband and the rosette rings. So cute! My two favorite items are: Princess hair clips (my daughter would love these) or the family tree print! I love the travel tissue case and the family tree. Cute Shop! !